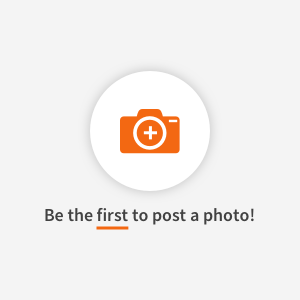 Find healthy, delicious turkey meatballs recipes, from the food and nutrition experts at EatingWell. 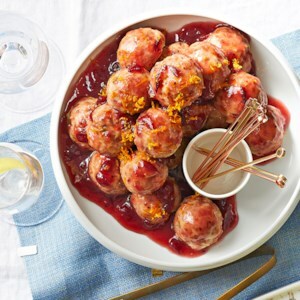 Ground turkey and bulgur form the base of these healthy Thanksgiving-themed meatballs, which are tossed in a tangy cranberry-sauce glaze. Serve these on a platter or keep them warm in a slow cooker. These versatile meatballs can be served for lunch in a meatball sandwich or for dinner over pasta. 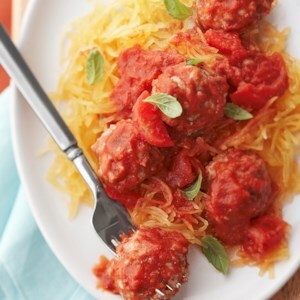 If you're looking for an easy healthy dinner that's low in calories and carbs, try serving them over cooked, shredded spaghetti squash instead of pasta! 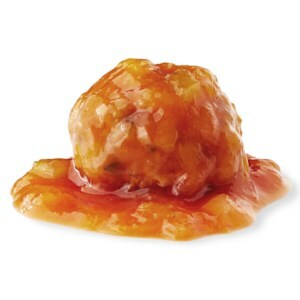 This honey-mango barbecue sauce is a perfect sweet topping for meatballs. The touch of cinnamon and dash of cayenne pepper add just the right amount of spice. 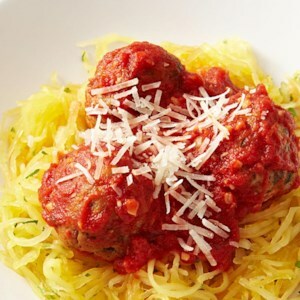 With this spaghetti squash and meatballs recipe, you can reduce the carbohydrates and increase the vegetable servings by skipping pasta and serving the Italian-seasoned turkey meatballs and quick, homemade marinara sauce over thin strands of cooked spaghetti squash instead. Cooking the squash first in the microwave and then in a skillet to cook off the extra moisture, gives the squash a more spaghetti-like texture. A slightly sweetened chicken broth gives this cabbage soup its delicate flavor. Make it a meal: Swedish rye crisps are the perfect accompaniment. 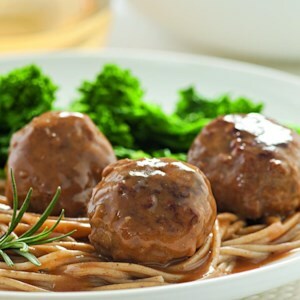 Lemon and rosemary flavor both these turkey meatballs and their velvety-rich sauce. Thyme can be used instead of the rosemary if you prefer. Serve with whole-wheat pasta or mashed potatoes. Heavy on exotic spices, this decadent sandwich is a great way to familiarize yourself with the joys of Turkish cooking. Lean turkey blended with lamb lightens the mix. 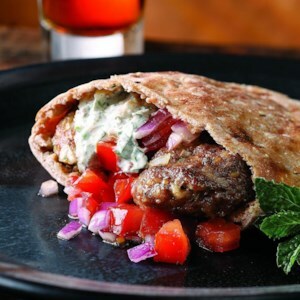 Stuff the patties into warm pita bread or roll the mixture into meatballs and serve with the yogurt sauce on the side as an hors d'oeuvre. 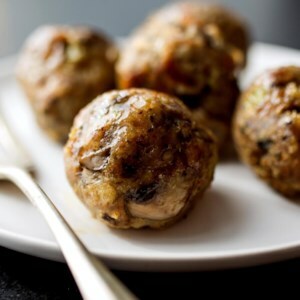 In this healthy turkey meatball recipe, a base of sautéed mushrooms, celery and garlic adds flavor and helps keep calories in check and portions hearty. 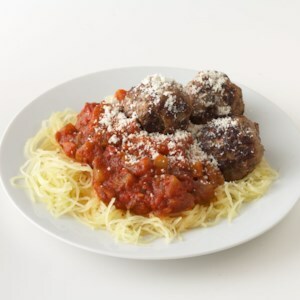 Serve these meatballs with marinara as an appetizer, on top of spaghetti or on a roll for a healthy meatball sub. This Italian Wedding Soup recipe is Italian comfort food at its best, and this easy soup recipe lends itself to countless variations. 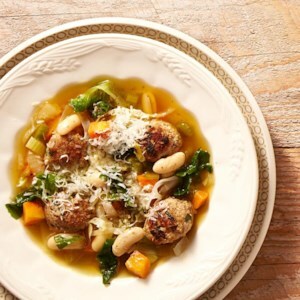 Substitute spinach, chicory, chard or any other leafy green for the escarole or kale, and any leftover cooked (or canned) beans for the white beans in this healthy Italian wedding soup recipe. 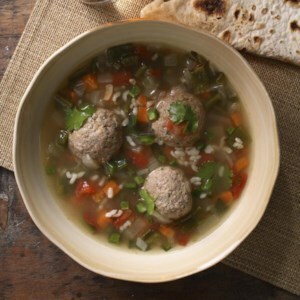 Albondigas, Spanish for “meatballs,” star in the traditional broth-based Mexican soup. Our version uses turkey rather than beef or pork for the meatballs, and we've pumped up the volume of fresh vegetables in the mix.